A non-profit organization consisting of members dedicated to bringing live folk music to the South Shore. This season we are celebrating our 40th anniversary! We are a non-profit all volunteer educational organization highlighting traditional and contemporary folk music since 1978. Our concerts feature the finest local, national and internationally known folk musicians. We host coffeehouses and “open mic” nights for local and developing musicians. Our Traditional Youth Ballad contest is held annually to encourage youth participation. 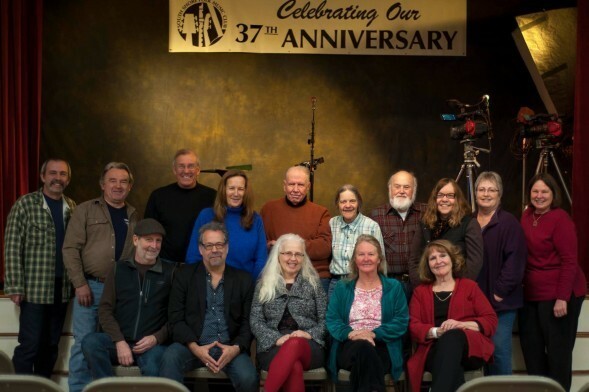 We are pleased that many folk musicians have performed at South Shore Folk Music Club over the years. We rent a great space in the First Parish Church, which is the community building of the Unitarian Universalist Church in Duxbury Massachusetts. All ages are welcome; come with friends or come alone. The building is wheelchair accessible and smoke and alcohol free. Baked goods, soft drinks, water, coffee and tea are available. Our loyal and supportive audience lets our performers know that their fans are still out here supporting them, and gives our coffeehouse and open mic performers the feedback and support they need to continue developing as artists. We rely on our members and volunteers to keep the spark of enthusiasm going, so please join us! We currently have about a dozen people who keep everything going. We are currently recruiting volunteer sound techs.